The best known and most common species of flea is the cat flea. The cat flea is approximately 2 mm long and reddish brown in colour. The flea is flattened laterally and this feature enables it to move easily amongst the hair of its host. However, the most distinctive features of the cat flea are the large jumping legs and the row of black non-sensory spines on the front margin of the head and on the rear of the first thoracic segment. The mouthparts which are adapted for piercing and sucking can be seen projecting downwards from the head. The eyes are apparent as are the antennae. Following mating, the female flea lays several hundred eggs. The eggs are laid in batches after each blood meal in the cat’s fur, bedding, resting site and also in areas where the cat is to be found. The eggs are small (approx 0.5 mm) white and oval in size. The flea emerges from the egg in the larval stage which is again white in colour, the larvae is legless and covered with large bristles. The larvae are not bloodsuckers and feed on general organic debris which is to be found in the cats’ habitat. The mature flea larva is approximately 5 mm long and it spins a cocoon of silk which very quickly gets covered with a large amount of dust and debris. Within the silken cocoon the pupa develops and when triggered stimuli such as vibration, the adults emerge to feed on the cat. 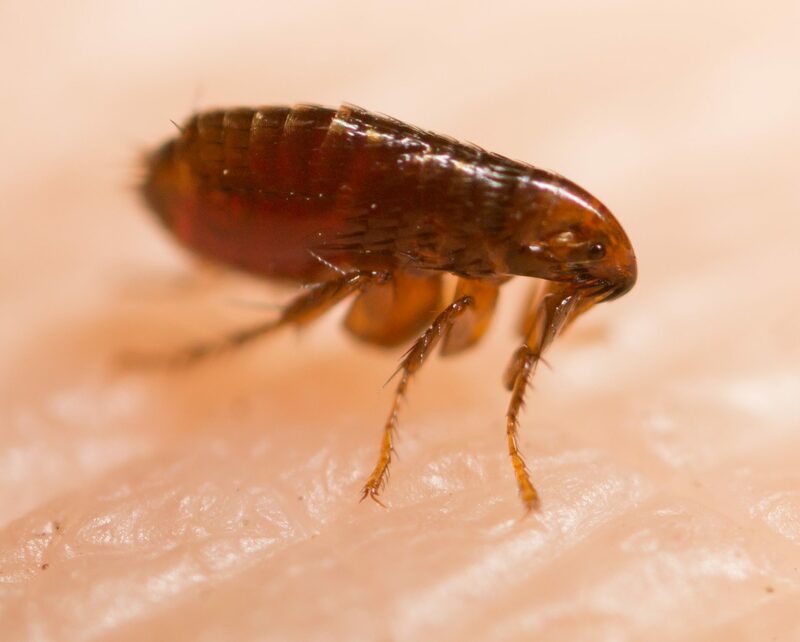 As fleas can survive for many months without a host it is always recommending when treating for fleas to treat both the animal concerned and the property. It has been estimated that 95% of flea eggs, larvae and pupae live in the environment and not on your pet. Although the cat and dog are the preferred hosts for cat fleas they will frequently feed on humans. There are various associated problems that can occur in your pets when a flea infestation is present. Unfortunately, the distress caused by flea bites can be considerable in cats and humans. The flea is a host for the cestode tapeworm. This develops in the digestive tract of dogs, cats and some wild carnivores, but also occurs in humans and particularly young children. Treatment consists of identifying the source of the infestation and if appropriate treating it with a suitable veterinary product. Such a treatment should not be carried out by a pest control technician but by the owner of the animal or a veterinarian. A residual insecticide should then be applied to all areas frequented by the animal concerned. Cleaning and vacuuming regularly all areas of the property including the bed will ensure that at each stage of its life cycle the flea infestation is treated.